I almost can’t believe that this quilt is finished. I’m embarrassed to say that I think this was started 4?! years ago. I was in a bee based entirely on sewing with red fabric. What can I say? That was when there were so many bees we couldn’t all keep up and we all got in over our heads. I’ve learned my limits, but at the time I think I was in at least 5 bees. And so I’ve amassed a collection of bee blocks that often leave me uninspired. I don’t particularly like red…it’s a tough color for me. So I think I joined this bee to try to overcome my fear of working with red. I don’t think it worked. lol And that’s why this quilt has taken SO long to finish. I just was not as inspired by the color palette as I imagined I would be. It’s a great color palette. Aqua, Red and White?! What’s not to love? But I’ve found that even though I love it when I see other people work with it, I don’t find it particularly motivational. I’m surprised by that. So, probably not a color combo I’ll pick soon for a quilt again (but don’t hold me to that…there’s nothing like proving yourself wrong!). 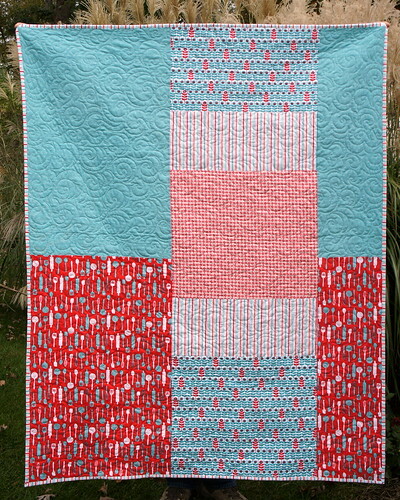 But I really love a lot of the elements of this quilt. 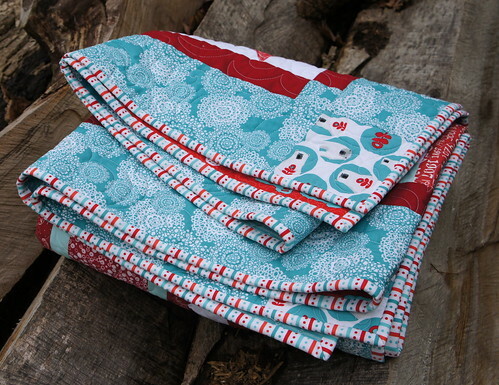 I gave all my bee members the fabric with the instructions to make any star block of their choice with white as the background, red as the main color, and the aqua as an accent. I got a really fun assortment of blocks and then they sat. and sat. and sat. And then along came Laurie Wisbrun’s Brr fabric. Hmm…perfect match!! It was worth waiting all those years for the perfect fabric match that tied everything together. 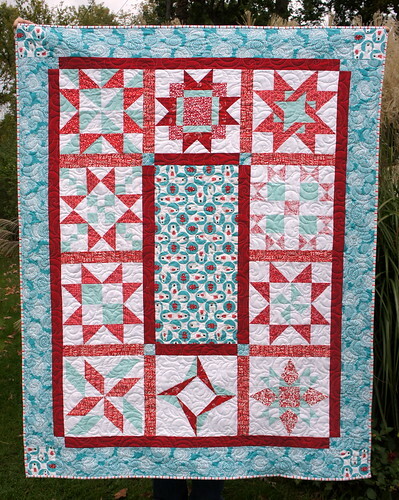 I used her fabrics for the polar bear center, the snowflake border, the binding and across the delightful pieced back. This is a pieced back that I really love. Sometimes they are hit or miss for me. But the proportions are working pretty well for me. There is a DS print from Joanns, a Jennifer Paganelli print, and bunches of Laurie’s fabric including a newly released print from Table Talk. I love combining all of these lines and seeing them blend so beautifully together. The binding was a favorite print of mine from Laurie’s Brr line that I have been hoarding. A stripe WITH polka dots?! It hits the right notes for me. But really it was PERFECT for this quilt and I had to use it. I love when the right fabric tells me where it should be. And boy does that binding just work the way it should. So, sorry for the lengthy write up, but this poor quilt has been in the making for four years and deserves its time in the sun. Or the snow as it were…ugh…but let’s focus on the happy again ;)Oh and linking up to the Blogger’s Quilt Festival. Good timing! Simply fabulous. I just love how this came together!! I think you made a great looking quilt. I know what it's like to fall out of love with a project. I have a few of those too. I understand what you mean about having a quilt languish. So glad you finished it and gave yourself the gift of sending it out. That's a wonderful quilt. I like everything about it…the blocks, colors, binding. Everything! this is a very pretty quilt. I love the colors chosen. may have been started 4 yrs ago, but it looks fabulous finished. And yes I so agree our health is so much more important than our pride. Lots of luck to you. Red is my favorite color! 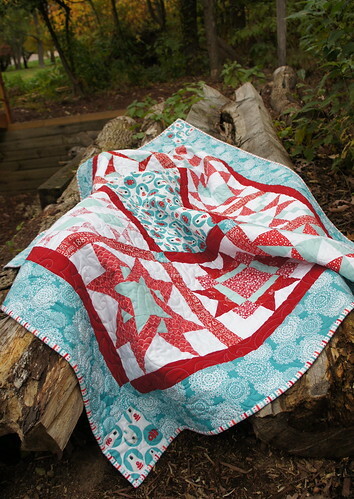 I also love stars in quilts. What a lovely quilt. I'm usually a hand quilter, but, I just haven't wanted to do much hand quilting the past few years. I finally had a quilt machine quilted earlier this year. The same quilter will be quilting another top for me next month (if I get the top finished). I'd say you made it great! Beautiful job tying it together! it looks so cohesive. i can't even tell it was a bee quilt. i love that striped binding too. it's a great print. This turned out fabulous. What a great quilt. I think it looks beautiful, would look so great under someone's Christmas tree!! I don't tend to use a lot of red either but you've done a really nice job of this one, Angela! I really like your pieced back – how you interrupted the two main fabrics with the strip down the center. Sometimes (usually?) my pieced backs come out pretty helter skelter. I think something a little more planned like this would be nicer. The thing is I NEVER buy fabric for backing so usually have few choices. Anyways, your back turned out so goo! 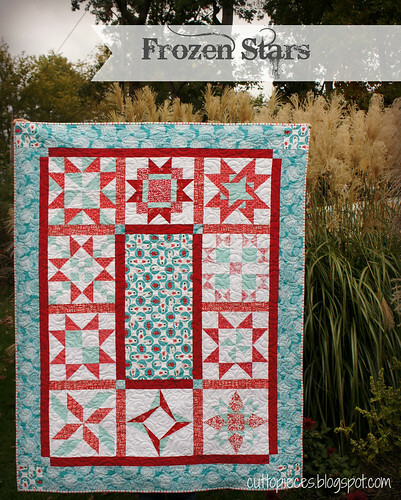 I love how you combined the stars with the large christmas print, the quilt is beautiful! This is one of my most favorite layout designs–I'm filing this away for future quilts. This is really a lovely quilt. 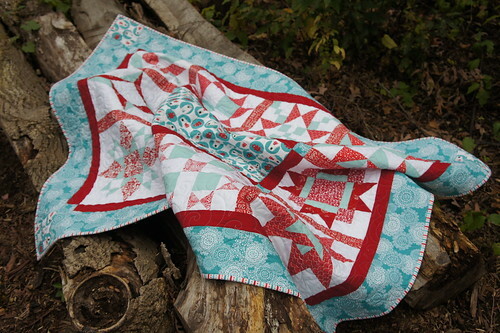 I adore the aqua and read, really makes quite a yummy quilt!